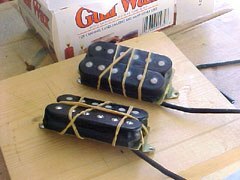 Another easy tutorial on how to pot/repot your pickups. 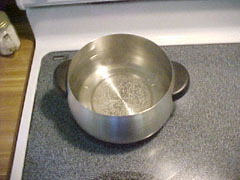 Start out bringing a half to two thirds of a pot of water to just barely boiling. 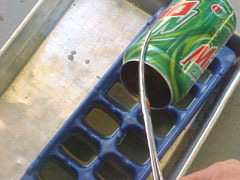 Whilst waiting on the water to start boiling, grab a empty soda can and take the lid off (if you use a standard can opener it takes a few turns but will eventually come off). 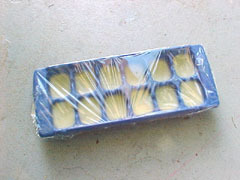 Cube 1/2lb (~227g) of paraffin wax and fill as much of it as possible into the can. Once your water has come to a boil, turn off the heat. Grab your can and hold it in an upright position in the middle so it doesn't tip over and watch the wax melt (keep adding the left over pieces as space permits). Try to add beeswax once your original 1/2 lb. of wax has melted. I used a candle made from pure beeswax which allows the wax to stay pliable much longer. 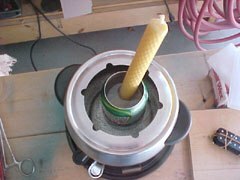 Paraffin wax starts to melt around 100°F (37°C) and beeswax higher at 150°F (65°C). A digital meat thermometer works great to monitor the wax temperature. 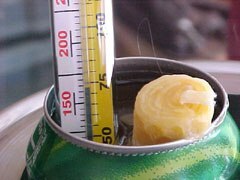 Aim for a little over 150°F (65°C) to allow the beeswax to melt properly and blend with the paraffin wax, however stick below 176°F (80°C) simply out of safety. Anything higher, carefully lift the can up out of the water. It will take a long time for the wax to drop down fifty degrees and harden back up so no need to rush anything. 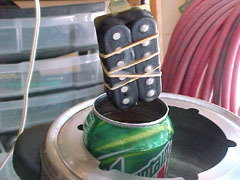 Wrap your pickup with a rubber band to keep the bobbin tape and its adhesive from coming undone. 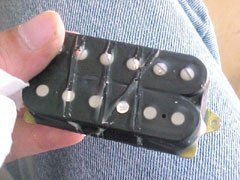 I am doing this to a pair of new pickups so the bobbin tape adhesive holds up really well. 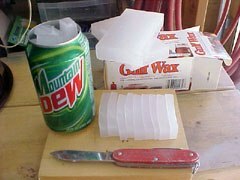 Start dipping in the wax and tap it on the bottom a couple of times to release any bubbles. 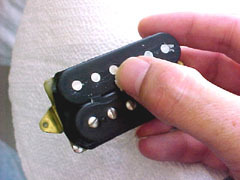 The pickup can sit there for a couple of minutes to let the wax penetrate the windings and displace any air pockets. 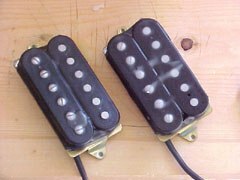 Raise your pickup out of the wax and dip it again to build up a nice heavy outside coat of wax. 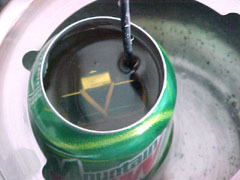 While the pickup is cooling, check the wax temperature. If it has dropped significantly below 150°F, carefully remove the can and place it well out of the way. Heat the water for a minute. Turn off the heat, replace the can carefully and monitor the wax temperature until it stabilises. Grab any other pickups you may need to be potting and repeat the process. After a pickup has cooled off a bit (about 3-5 minutes) it is safe to take off the rubber band and go for a couple of more quick dips! You can do this in the same session, or let the wax fully harden off and do it some other time. A second dip is always good. 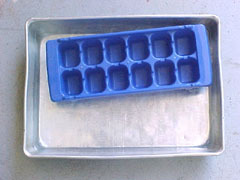 Here's a tip for later that only costs a buck or less, grab a cheap plastic ice cube tray and place it on top of some cool water in a bake pan. Using tongs or pliers pour your extra wax in the tray and let it cool so you can reuse later on when you need to pot more pickups. Be super careful not to accidentally spill hot wax into the water! 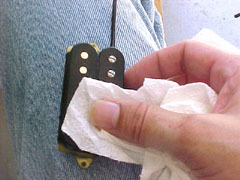 Now that your pickups have cooled off (about 4-8 minutes) You can start cleaning off the top, I just use my fingernail because I really don't want to scratch the surface. Cleaning the tops with tough paper towels will take care of the rest of the wax buildup and buff the surface - you're good to go! All nice and freshly potted with a thin coat of protection. Don't forget to wrap your wax after it cools since you do not want any contaminants getting in there during storage! 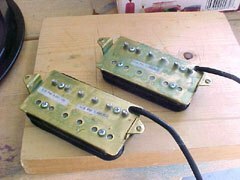 Repotting Your Pickups by Brian Calvert is licensed under a Creative Commons Attribution-NonCommercial-ShareAlike 4.0 International License. Attribution —You must give appropriate credit, provide a link to the license, and indicate if changes were made. You may do so in any reasonable manner, but not in any way that suggests the licensor endorses you or your use.